Put cayenne pepper in everything. Act nervous and drop stuff. Try out your most experimental recipes. When Ramsay yells "hey you" yell back "hey what?" Bust out laughing during a tense dinner service. Ask Ramsay if you can eat some of the food he sent back. Spill sauce all over the front of your jacket. Crawl around the kitchen on all fours and say "I lost my contact lens." Always say "five more minutes" when a teammate asks you how long on an order. Put ketchup on your finger and tell Ramsay you need medical attention. Argue with your teammates just for fun. Put a mountain-sized portion on your plate in every cooking challenge. Sneak into Ramsay's bedroom while he's asleep and bang pans together. Refuse to eat the punishment food. Be over the age of 40. Put ketchup on the wellingtons. Insert a toothpick with a little American flag into every entree. Make your risottos extra soupy. Cook the scallops until they're black. Blame your mistakes on the sous chef. When Ramsay tells you the rack of lamb is raw, look indignant and answer "No it's not!" Cook an eclectic dish that combines eight types of cuisine. Dump a can of Chef Boyardee on a plate and garnish with parsley. During elimination, answer the question "Why should you stay in Hell's Kitchen?" with "well... um... uh... I don't know, really." Flirt with the celebrity table guests. Start lots of kitchen fires. Show your enthusiasm by yelling "wooo" every five minutes. Go back to the dorm and sleep during your team's punishment. Demonstrate your knife juggling ability to diners while cooking tableside. Ask Ramsay what kind of hair gel he uses. Cook all filet mignons until well done and explain "they're better that way!" Drink ten glasses of champagne during a reward trip. Break down in tears at the pass and explain you're still dealing with your pet yorkie's death three years ago. Top every dish with melted cheese. Cook your pasta no longer than 30 seconds for that "al dente" texture. Ask attractive members of the other team for their phone numbers. Eat half of everything you make. Insult the guests during tableside service. Let your food cool off completely before taking it to the pass. Pick a fight with a sous chef. Give all wrong answers in the blind taste test. 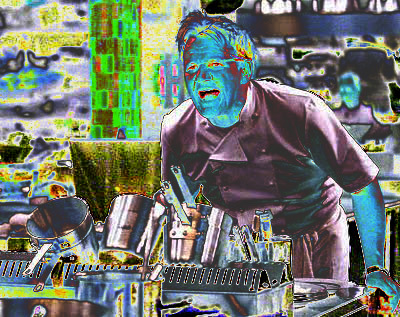 Tell Ramsay "I don't feel so good" and toss your cookies.